The Dictionary of Unfortunate Ideas: Bond No More! A New Way to Make Money in the Housing Market! Pierce Brosnan has finally given up the Walther PPK. No more shall he ask for medium-dry vodka martinis, shaken, not stirred (he can go back to his real love: Jolt Cola.) No more shall he careen about in an Aston Martin, except for those films in which BMW had got the sponsorship. Which is just as well, as the former Remington Steele was entering Roger Moore, Sean Connery territory. Seriously, how many people will believe a Bond who can get the senior-citizen discount at the local Denny's, not that the real Bond would deign to eat there. 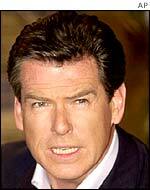 Of course age was the reason Brosnan was sent packing out of MI6 and not pictures like this one. (Relax ladies, it's just a role in a movie...maybe.) The real Bond though couldn't be magically transformed into a younger, goofier version, the way Jack Ryan was transformed from Harrison Ford into the gonad-prankstering Ben Affleck in The Sum of All Fears. Wino 1: Watch it man! Some of us are trying to relax here! Wino 2: Shoot, dude! That was totally uncool. James Bond: Gentlemen, did you see a man, holding a cat, run through here? Wino 1: Who the hell are you? Wino 2: BOND?? Man, you ain't no James Bond!! Wino 1: Naw, man. You can't be Bond!! You're all plain faced, son. Bond is like, Pierce Connery Moore, Jack. You're kinda Robert Lance Henrickson Redford Shatner DeVito. Wino 2: Prove it, dude! Wino 2: Prove you're James Bond. Wino1: Yeah, man! If you're James Bond, then you can do one of those Bond deals! Wino 1: Wait, I know just the thing! Wino 1: Here! (He hands Bond the bottle.) Tells us what wine this is. Wino 2: Yeah, dude! If you're James Bond, identify that wine! James Bond: I really don't have time for this. Wino 1: (to Wino 2) See, he doesn't want to do it, 'cause he ain't Bond! James Bond: Oh, all right! James Bond: (with disgust) It's Ripple. Wino 1: Yeah...but what year? Wino 1: No, no, that was an easy one. We've got to come up with something harder! Wino 2: Wait, I know! (He produces a deck of cards.) Everyone knows that James Bond is the worlds' luckiest gambler. (To Bond) Here, draw a card and hold on to it. Wino 2: (Drawing a card and holding it up) There, I got a King of Diamonds. Let's see him top that! Wino 2: Whoa! Very Bond, dude! Wino1: I'm still not convinced! Wino 2: Two out of three? Wino 1: Naw, man!! Let's see him pick up some chicks! Wino 2: Yeah, dude! You should be able to pick up a couple of chicks, just like that! James Bond: Listen, the helicopter pilot was a beautiful blonde woman. Would it help you to know that I had my way with her on the flight over here...while she was piloting the copter!? Wino 2: Oh, man...you could just be saying that, dude. Wino 1: I completely agree with my associate. We need to see some impressive chick magnetism right here in the alleyway. Wino 1: No, no, no, no man! I'm mean, think about it. How do we know you aren't just Arthur Fonzarelli, pretending to be James Bond? Wino 2: Excellent point, dude! James Bond: All right!! All right. I have a foolproof method of proving that I am, in fact, James Bond. Wino 1: Sounds good to me. Wino 2: Shoot away, dude! James Bond: Licenced to kill, you see. James Bond: (Sighs) That's the third time today.